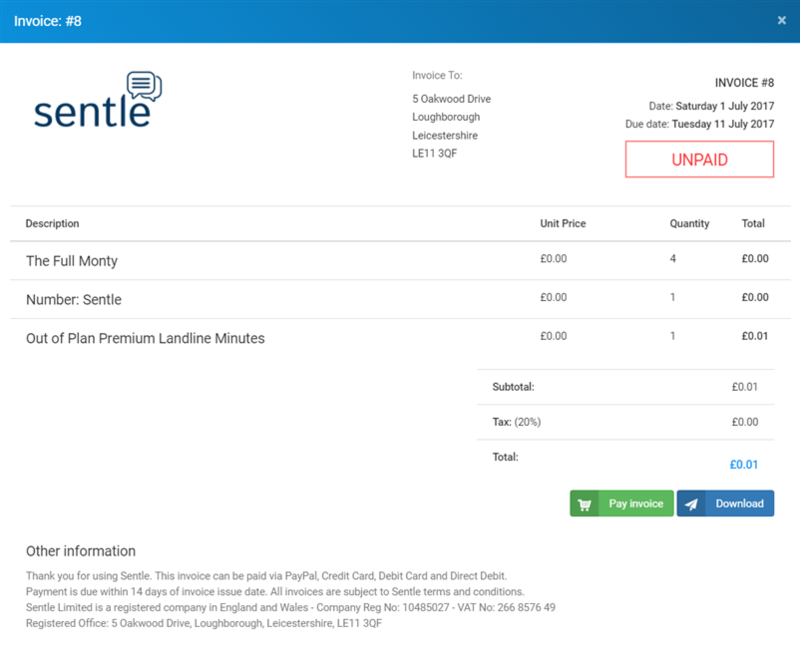 Within the Invoices and Payment history area of Sentle you can view all invoices and pay for any outstanding if you don’t have an automated payment set up. Selecting to view your invoice will load the chosen invoice in a view where you’ll you have the option to pay (if required) or download the invoice. Invoices that are being paid by direct debit will move into a 'pending' stage which means that we are awaiting notification of successful payment from your bank. If you have an automated payment method and a payment fails, Sentle will automatically retry to take payment (1 time for Direct Debit, 2 times for debit or credit card). You will be notified via email that automatic payment as failed and will be asked to contact us or update your payment method. Please note: Sentle automatically monitors the state of invoices and as such any unpaid invoices run the risk of your system being locked down as stated in the Sentle terms and conditions.